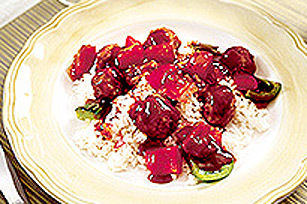 These sweet and sour meatballs are fast and easy. The incredibly delicious sauce is simple to make and adds the perfect tangy flavour to these homemade meatballs. Mix 2 lb. ground pork with 1/2 cup bread crumbs, 1 spoonful ground ginger and 1 egg until well blended. Shape meatballs and place on lightly greased baking tray. Bake at 375°F for 20-25 min. Chop 1 each red onion and red and green bell peppers; place in large Crock-Pot. Add 1 can (14 oz.) undrained pineapple chunks, 1 large spoonful soy sauce, 2 cups KRAFT Regular Barbecue Sauce and cooked meatballs. Cover Crock-Pot and heat on HIGH for at least 1 hr. and up to 4 hr. Serve over hot cooked instant white rice. Shape and bake meatballs up to 2 days ahead of time. Simply reheat with addition of vegetables in Crock-Pot.